The natural trim is the simple yet sophisticated way you can look after your horse's hooves as nature intended, making them healthy from the inside out. If you look at a healthy wild horse hoof, the beauty of its form and function are something to behold: the organic curves, its regularity and toughness. Like a stone polished in the ocean, the wild hoof is formed this way by the constant motion over the vast distances that the horse roams in his natural state. If you stop to think about it for a moment, it is an amazing feat of nature that such a perfect balance is achieved between the form and function of the hoof. In domesticating horses, we have disrupted this balance. Now we have a duty to take over the maintenance of the horses hoof, and the best way we can do this is simply to copy nature's simple but sophisticated blueprint for the healthy hoof. The great thing is that the simplicity of the natural trim gives almost any horse-owner the ability to carry out themselves this ideal maintenance of the horse hoof, with all the benefits it brings to the horse's health, comfort and performance. Whether your horse is already barefoot or shod, the natural trim is the cutting edge in intelligent hoof care. Its features are essential to the healthy functioning of the hoof, and some of them are often left out even by well-known barefoot trimming methods, let alone the shoe-orientated farrier's trim. The natural trim is a minimal approach to barefoot trimming. 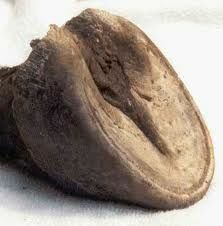 This means that we only remove only the hoof material that would wear away naturally in the horse's wild state. The philosophy is that the healthy hoof form comes from the inside out when the hoof is maintained in the right way, instead of imposing a predetermined geometry on the hoof from the outside. In the natural trim, the hoof wall is not rasped higher than a few centimeters above ground level, as this is the only wear that takes place in the wild. 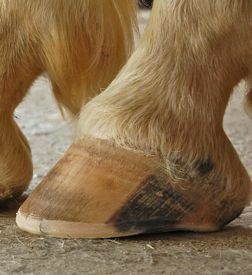 Many hoof trimming techniques involve significant rasping of the outside of the hoof wall in order to remove any flaring and irregularities, however this practice only makes the hoof look prettier from the outside. In reality it thins and weakens the hoof wall, and it doesn't actually alter the inner working of the hoof at all, so that the flaring that was rasped off will just re-occur as the hoof wall grows down. The philosophy of this minimal trimming method is that all it takes to keep the hoof wall growing down in the right form, without flaring and distortion, is to maintain the bottom edge of the hoof wall at the right height and width relative to the level of the sole. In other words, the solution lies in simply not letting the hoof grow too long, because this is what, to a large extent, causes the flaring and distortion of the hoof wall. 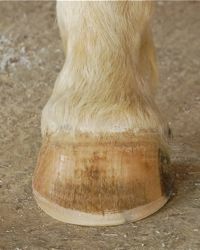 The natural trim is a non-invasive approach to hoof trimming, that, above all, respects the integrity of the hoof capsule. It does not advocate removing ANY sole or frog material, because the sensitive tissues inside the hoof need all the protection they can get from these outer structures. Some trimming methods involve aggressive cutting back of the hoof wall right into the white line in an attempt to force a certain geometry on the hoof (read about our own experience with this on: Different Barefoot Trims: Our Hoof Care Journey). This risks causing serious discomfort and sensitivity to the horse, which starts a negative cycle: the horse lands toe-first to avoid impact on the more sensitive heel and frog region, this not only causes concussion to the pedal bone and the whole limb, but the shock-absorbing structures of the foot are not stimulated, and therefore cannot strengthen and become more protective. The natural trim always maintains the protection of the hoof wall layer, giving you the peace of mind to know that your trim is not causing the horse discomfort. You will find that just by maintaining the right hoof wall height and width, a hoof that was distorted and spread from flaring, will gradually grow down with a 'tighter' white line and straighter hoof walls. The wild hoof has a unique form that promotes the optimal flexion of the structures, many trimming methods miss out this essential organic shaping of the hoof wall, however in the Seven-Step Natural Trim eBook Guide this feature is clearly described, and is an integral part of the trim technique. You won't believe what a difference this one feature makes to the shape of your horse's feet. Many barefoot trim methods have complex systems for measuring and correcting hoof imbalance, i.e. lack of straightness and symmetry in the hoof. Sometimes these methods aggressively counteract the imbalance in an attempt to correct it. This approach can actually compound the problem, causing even greater imbalance, and sometimes putting excessive strain on the limb itself. The Seven-Step Natural Trim eBook How-to guide (below) describes a unique, simple way of balancing the hoof in relation to the internal structures so that important heel balance is brought into alignment with them. Using this technique with our own horses, we have seen hooves with deep-seated balance problems gradually become straighter, from the inside out, without putting strain on the joints of the limb. Can I Trim My Own Horse's Feet? If you are not already doing your own hoof trimming, you may be wondering if it is a task that you are capable of taking on. Many horse-owners are used to handing over this responsibility entirely to their farrier or barefoot practitioner. With the natural trim technique, if you are up to the challenge of learning a new skill, there is no reason why you should not be able to take care of your own horse's hooves. 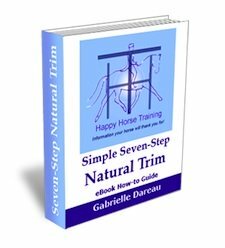 The simplicity and minimal nature of the Seven-Step Natural Trim described in our step-by-step eBook guide makes it an ideal choice if you have not trimmed before. Because the trim always relates back to the individual hoof, it does not pose the same risk of doing damage to the hoof as methods that impose a rigid geometry on it. The excessive amounts of rasping and paring involved in these techniques are also very demanding for the inexperienced trimmer. With the natural trim, you save time and effort, and gain the peace-of-mind that you are respecting the horse's comfort and well-being, as well as promoting the healthy hoof in the best possible way. Of course, learning hoof trimming, like any manual skill, demands determination and persistence in order to acquire the tool handling skills that make the job easy, but the reward for this is a skill that gives you the flexibility to keep your horses feet in top condition by trimming regularly, whenever they need it. It is a great liberation to no longer have to depend on the farrier, as well as being a significant economy! A wild horse's hooves are continually being worn down, so that they stay consistently in the right shape, and this is vital to the healthy functioning of the hoof. The problem is, when we rely on a farrier or barefoot practitioner to trim our domestic horses' feet, that it is just not practical, or economical for them to visit as regularly as is ideal for the health of the horse's hooves: that is about once every three weeks. This means that a horse who is only trimmed every 6-8 weeks, has hooves which are overgrown the majority of the time, causing the hoof to distort, and interfering with healthy function. 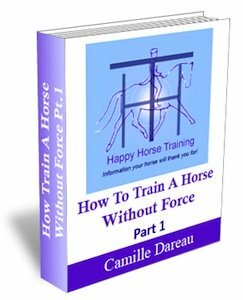 However, if you learn to do your own trimming, with the straight-forward method described in our eBook guide, then you can maintain your horse's hooves as regularly as you like. Even once a week if you like. The more regularly you do it, the less work it is, the less time it takes, and the more your horse benefits. The Seven-Step Natural Trim guide explains how you can adapt the trim method for more regular trimming. Click here to find out more about The Simple Seven-Step Natural Trim How-to Guide, and get your copy.